GlassFish is a free, open source, production ready application server. It is the environment's reference implementation and the first Enterprise Java server to implement Java EE6. 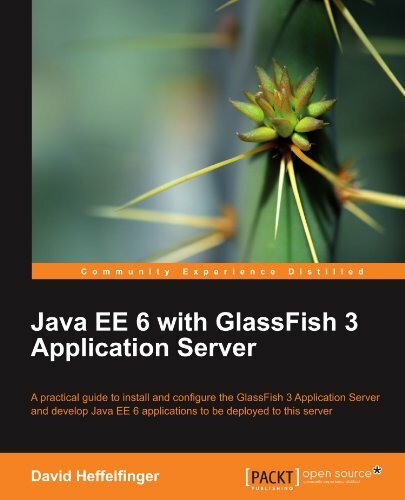 Although GlassFish server delivers a flexible, lightweight and extensible Java EE 6 platform, it can be challenging to get beyond the basics and develop Java applications deployed to GlassFish 3 application server. This book takes an in-depth look at all of the major new features in Glassfish 3 and how it differs from previous Glassfish versions. This book explains GlassFish installation and configuration, and then moves on to Java EE 6 application development, covering all major Java EE 6 APIs. It is a handy guide for the advanced Java programmers as well as Java EE 6 beginners. This book begins with the installation of Glassfish 3 and deploying Java applications. It also explains how to develop, configure, package and deploy servlets. We will also learn the processing of HTML Forms. As we move on, we will develop Java Server Pages and get to know implicit JSP objects. We will get to know all the JSTL (JSP Standard Tag Library) tag libraries. This book gives us a better understanding on how to manage data from a database through Java Database Connectivity (JDBC) API and the Java Persistence API (JPA). We will also learn more about the newly introduced features of JPA 2.0 and develop JSF 2.0 applications learn how to customize them. We then set up Glassfish for Java Messaging (JMS) API and understand the working of message queues and message topics. Later, we use the Context and Dependency Injection (CDI) API to integrate application layers and study the SOAP based web service development using the JAX-WS specification. Finally, we learn more about the Restful web service development using the JAX-RS specification. The book covers the various Java EE 6 conventions and annotations that can simplify enterprise Java application development. The latest versions of the Servlet, JSF, JPA, EJB and JAX-WS specifications are covered, as well as new additions to the specification such as JAX-RS and CDI.